Meet the brandymen, Keith and Craig. Craig (Mr. W) and Keith (Mr. D) shared a love of Walla Walla wines, the small unique city itself, and an interest in distilling. Mr. W had spent some time in France, and learned to appreciate good brandy. His memory of a glass of cognac after every meal spurred the idea that he and Mr. D could create a quality local craft brandy. Convinced that Washington wines and Walla Walla wines in particular were the best in the world, they looked for the brandy they thought would be distilled from these fine wines. They could not find any craft distillers, so they made the wise decision to make brandy themselves. 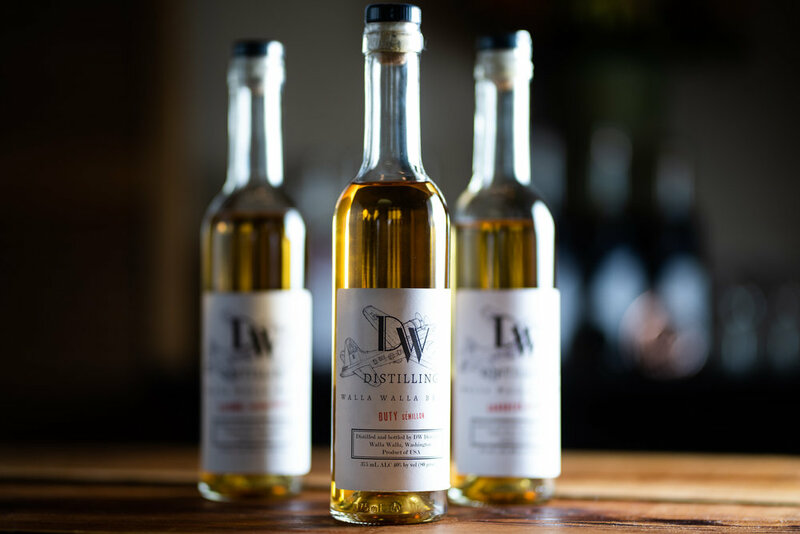 Hence, DW Distilling was born – located, of course, in Walla Walla! Want to keep up on the latest news from DW? Like us on Facebook or follow us on Instagram! My D (right) and Mr. W (left) tasting some of their fine brandies. Brandy began as a way to preserve wine. Once distilled, the "spirit" of the wine would last forever, and could then be taken on long voyages. In modern times, typical brandy is made from low-quality wines that are only intended to be distilled. The wine is distilled twice, then blended with caramel and other additives to give it color and taste. But our brandy is made a little differently. First of all, every bottle of DW brandy started with great wine. These incredible wines are already barrel-aged and bottle-ready, so we simply distill them once. This preserves the complexities of the wine and the subtleties of the winemaker's art. Once distilled, we simply barrel-age the brandy until it's ready to bottle. The result is a smooth, complex brandy that highlights all the notes of the original wine. Come visit our tasting room, get a tour, a drink some brandy with us! Blended with many different wines, our blend is a perfectly balanced brandy, fit for any occasion. It's as good with an ice cube as it is in a great cocktail. Our vintner's select is crafted from one Walla Walla winemaker’s vintage only. One vintner, one vintage, one brandy. This changes constantly giving the palette infinite variety, vintage by vintage.